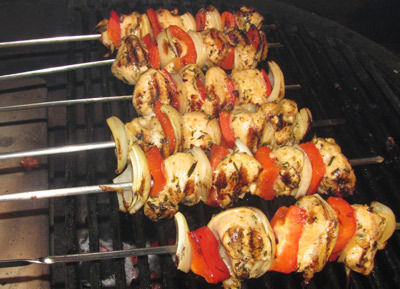 Is it the lovely rich color of grilled chicken shish kabobs that makes them so appetizing? Or the lightly spiced taste? Whichever it is, all I know is that when I cook this recipe, everybody wants one. Shish kabobs originate in Turkey and it's fair to say that the original shish probably was beef or lamb but today chicken is probably the most common and popular in the Western world. The term “shish” actually refers to the skewer rather than the marinade or indeed the type of meat used and for me, I like using chicken because you can really see the marinade in the rich yellow color of the flesh. The marinade is really easy to make up and when finished, don't throw it away. Fry it up in a pan, add a can of chopped tomatoes and you've got a lovely spicy pasta sauce. It's pure non-processed ingredients all the way so no allergens to be concerned about. 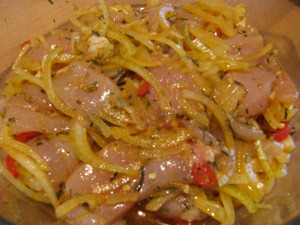 Make up the marinade by adding all the marinade ingredients except the chicken to your marinade bowl and give it a stir. Dice the chicken breast into 1 inch cubes and add to the marinade. Give everything a good stir, cover and refrigerate. The full marinade time is 6 hours so refrigerate for 4 and then bring the bowl out of the refrigerator so the meat can get back up to room temperature before cooking. If using bamboo skewers, put these onto to soak at the same time. Prepare your chicken kabobs by threading alternately one cube of chicken followed by either a slice of onion or a square of red pepper. Note: I've done these kabobs in a kamado. The best way to do this is to divide your firebox in half and use one half of the heat deflector stone. 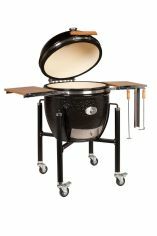 This means you can grill the kabobs directly on one side whist keeping the handles of the skewers (relatively) cool on the other side where there is no direct heat. Over high heat grill the kabobs for about 15 minutes and turn them regularly to ensure an even cooking. 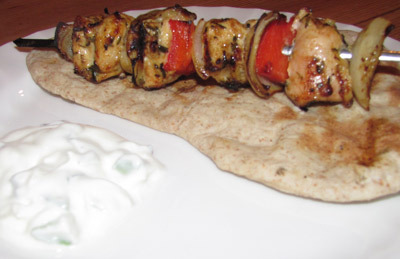 Serve your grilled chicken shish kabobs with pitta bread, salad and a yogurt cooler.